Mansukh Mandviya is in his mid-40s and also looks young for a central minister, but he is not a novice in politics. When he first became MLA in Gujarat, in 2002, he was barely 30. An ABVP product, Mandviya is a Rajya Sabha member. As a minister of state, he looks after two ministries which take care of five sectors crucial to the economy. In a freewheeling chat with Pankaj Kumar, he speaks about his ministries, BJP’s prospects in Gujarat and his mission – cycling. What are the steps taken to regulate the prices of drugs and medical devices? We have fixed the ceiling prices of essential medicines. Also, in the previous budget, the finance minister had announced a plan to open 3,000 Aushadhi Kendras across the country, where medicines would be available at affordable prices. On what basis is the ceiling price for essential medicines fixed? The ceiling price is a combination of the average market price and the production cost. We collect data on prices of a particular essential medicine in markets across the country. Then we calculate its average and accordingly fix the ceiling price. We take into consideration the production cost of that particular medicine. We also consult all the stakeholders. The ceiling price has saved the poor patients an amount of Rs 5,000 crore. What about patented medicines, some of which are beyond the reach of the poor? If the formulation comes under the essential medicine category, we fix its ceiling price. What steps have you taken to ensure quality of medicines produced in India which has come under heavy criticism from FDA and others in recent years? We fulfill the World Health Organization’s parameters. We have proved to the world that the medicines that we produce in India are at par with global standards. You have formed a cycle club for members of parliament. Tell us more about it. Simplicity is no big deal. We all should strive for simplicity in lifestyle. The club is meant to popularise the use of cycle. A common man rides a cycle and nobody notices. But when we MPs ride cycles, media will take note of it. More and more people should use cycle as a means of conveyance. It will save environment and is good for health as well. I have been talking to members of parliament. More than 35 of them have joined the cycle club. We all use cycle to reach parliament. 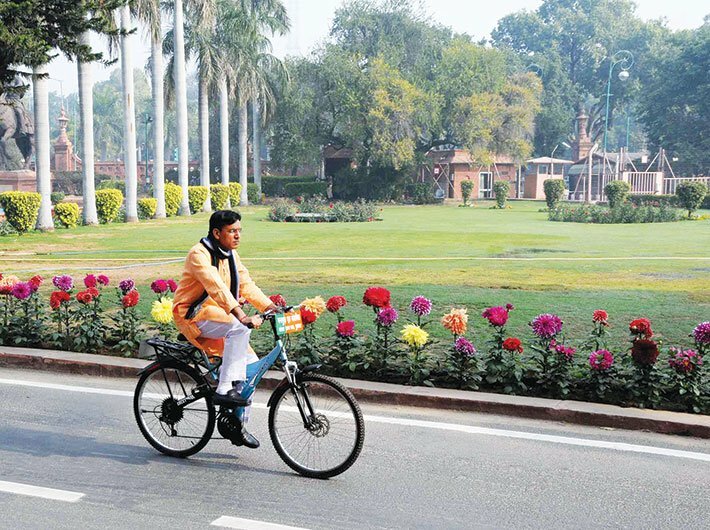 My ministry has decided to build cycle tracks on national highways, wherever it is possible. The use of cycle can solve so many problems. Is there any way the rising population of cars in cities like Delhi can be discouraged? Pollution levels in Delhi have been above dangerous mark over the last few months. I appeal to all to walk, cycle or use public transport as much as possible. Parliament is very close to my office, so I walk down to parliament. I request people to use four-wheelers only when necessary. Of course, you can’t force people to change their ways through new laws. Change in people’s mindset is needed. Creating awareness is important. Now that this round of state elections is over, all eyes will be on Gujarat, your state. The BJP has been in power for more than two decades now, and this will be the first election without a charismatic leader as your top candidate. Plus, the party is facing troubles over the Patel-dalit agitations. How do you look at your party’s chances? Reports suggest demonetisation has hurt the business community. How do you think it will impact your party in Gujarat? Demonetisation is in national interest. We don’t see it in terms of political loss or gain. Ten years down the line, demonetisation will be a topic of research… how this decision helped India grow into a prosperous nation. Demonetisation has no negative impact, be it in Gujarat or the entire country.